My son loves wolves. 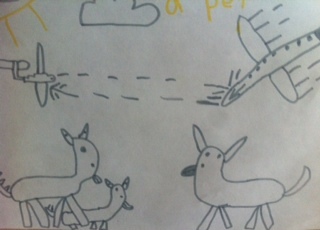 Our walls are plastered with his drawings of these strong, brave, tragically misunderstood creatures. Last year—our first year of homeschool—we devoured many books and documentaries on wolves. Felix even created his own board game, where the animals had to evade all of the traps, poison, and guns, in order to get safely up to Canada. So when I heard that the U.S. Fish and Wildlife Service was holding a public hearing in our city on the de-listing of Gray wolves as Endangered Species, I thought it would be a great opportunity for Felix to express his support for the wolves and see the political process in action. As soon as I told him about the hearing and an accompanying rally, Felix jumped to his feet and announced his intention to “speak up for the wolves.” He began pacing back and forth like a defense attorney, castigating anyone who disliked wolves and declaring—to my alarm—his willingness to “take a bullet” for one of his furry friends. The next day—of his own volition— he made a petition for “Wolves” with two columns: “Yes” or “No.” He brought it to his art class, and every single student (and as many of museum staff he could corner) signed in favor of the wolves. It was the same day as a contentious special election, and people were relieved to sign an eight-year-old’s wolf petition. Felix was thrilled with his twenty-five signatures, which he was sure would convince the government agency not to de-list the 5,000 wolves in the lower 48 states, putting them back into grave danger of being killed by humans. On the night of the hearing, it was cold and drizzly and neither of us was very motivated to go. Another mother and son had already begged off. But I wanted Felix to honor his beliefs and commitments. So we put on our warmest sweaters and coats and brought an umbrella, prepared to howl out in the rain. We got there a bit late; there were no protestors outside of the high-rise hotel. I did, however, count nine police cars. We hurried into the lobby and caught the tail end of a pro-wolf parade, accompanied by wolf cries and signs reading, “Wolves are Essential,” and “Wolves Can’t Read Maps.” The group eddied back into a room reserved by pro-wolf organizations doing outreach and education. Felix and I made the rounds, writing comments for the drop-box, taking a photo with a life-size replica of a Gray wolf, perusing educational material, assembling a wolf mask. “So where are these cattle rustlers who hate wolves?” Felix asked a white-haired woman sitting at the poster table. She widened her eyes. The woman leaned forward and whispered: “They’ve got a room of their own. But only four people are in there.” We appreciated this information, which must have involved some sneaky re-con. By the time we finished with our mask, most wolf lovers had gone to the “ballroom” to await the hearing. Felix and I were barred entry by an official who said that we were not allowed to bring our signs. I admit I was restless, too, standing as cowboy-hatted folk circumvented us like a pair of pine trees. A few of them glanced our way with good-natured cynicism. I know that look well. When I was Felix’s age, I lived in a small ranching community in Nevada, and wanted to be a cowgirl more than anything. I revered cowboys in all of their hardiness, masculinity, humor, pragmatism and independence. Standing amongst the Marlboro Men in the lobby of the hotel, I could even empathize with them. How galling to not to be able to protect their “property” when a pack of predators came calling. How annoying to submit to a bunch of regulations handed down all the way from Washington D.C.
And yet, I know that ranchers have profited by holding grazing rights to public land, and are well-compensated for livestock lost to wolves. According to a recent New Mexico Wilderness Alliance newsletter, “This great hoax is played out despite the fact that ranchers understand clearly how small depredation [killings] by wolves is compared to the effects of disease, road kills, falls and neglect.” In fact, only .2% of cattle losses are due to wolf depredation, according to the 2011 National Agricultural Statistics Service report. As soon as the hearing started, Felix and I abandoned our posters and slipped into the ballroom. There were about 500 people in attendance; nearly every seat taken. Everyone was mixed up together—anti and pro-wolf activists alike. It was impossible to tell who amongst us reviled the wolves, and who wanted them to thrive. The first twenty minutes involved a power point presentation on gray wolf recovery in the United States, and proposed changes. Basically, the U.S. Fish and Wildlife Service (USFWS) wants to remove federal protection of gray wolves—de-list them—while re-classifying the Mexican Gray wolf as an endangered species in order to continue its recovery. There are currently only 75 Mexican wolves living in the wild, and 300 awaiting release, held prisoner by politics. I leaned over to Felix and tried to explain some of the terms: extirpate, depredate, species, county. He kept backing his seat away from me. “What’s wrong?” I finally hissed. Finally we got to the “Public Comment” portion of the hearing. This involved another twenty minutes of (mostly) county managers complaining—in two-minute allotments—about being left out of the decision-making process and insisting that the Mexican Gray Wolves were detrimental to local economies. Then one of our state senators got up and made a eloquent little speech, urging the agency officials to make decision for the wolves “based on science,” rather than political or partisan interests. The crowd erupted with cheering and applause. Suddenly we could feel the energy in the room, swelling with support for the wolves. But it didn’t last long; the moderator cut in angrily, threatening to clear the room if there were any more interruptions. Everyone was quiet after that. The tiny speeches—short on compelling evidence—continued. I looked over at Felix, who was struggling to stay engaged. I was glad we hadn’t signed him up to speak; the hearing was scheduled to go on for another two hours. I offered him the children’s book on wolves I’d picked up, but he stoically declined. We agreed to leave in half an hour. “Lets wait and see,” I cautioned. Based on names (i.e. : “Bucky”), professional assignations, or appearance, I wasn’t always correct. One self-identified “Republican” and “Hunter” in a cowboy hat surprisingly turned out to be pro-wolf. He said that his grandfather had been a Bison hunter, cutting off the humps and leaving the carcasses to rot, and that he didn’t want that to be his legacy to his grandchildren in respect to the wolves. He also mentioned how wolf recovery had benefited the deer and elk populations in his state. At seven o’clock sharp, Felix and I got up to leave. “So, what did you think?” I asked as we got into the car. ”It was great,” he said without much enthusiasm. Felix was silent in the back seat. I imagined him contemplating his contribution to history. “I was just saying that.” He shrugged. “I never promised it would be fun,” I snapped. “Yes you did,” he said. He looked like he was about to cry. Well, maybe I had intimated that it would be a little more exciting, howling with animal activists in the rain. But hadn’t I tried to explain everything in simplistic terms? Hadn’t I kept up a running commentary in his ear? Hadn’t I offered a diversion? Hadn’t we agreed on when to leave? But still I was fuming; I felt seriously disappointed, hurt, maligned. What? I wondered glumly. Wearing a wolf mask in a hotel lobby? Holding up a sign to an indifferent crowd? Listening to a bunch of boring speeches he couldn’t comprehend? His mother’s bad breath? Her disappointment in him? In the end, I realized I couldn’t expect my son to understand. He is still a wild, independent, freedom-loving creature. Some day, I am sure, we will manage to snuff it out of him. This entry was posted in Uncategorized and tagged activism, endangered species, gray wolves, homeschooling, mothering, parenting on November 25, 2013 by Lillian Gilmour. Very honest and authentic and hilarious and a little heart breaking, too.